Enlarge/ A protester holds a sign outside FCC headquarters on Dec. 14, 2017 before the vote to repeal net neutrality rules. Net neutrality advocates are preparing one more “Day of Action” before the expiration of a key deadline for restoring the repealed rules. 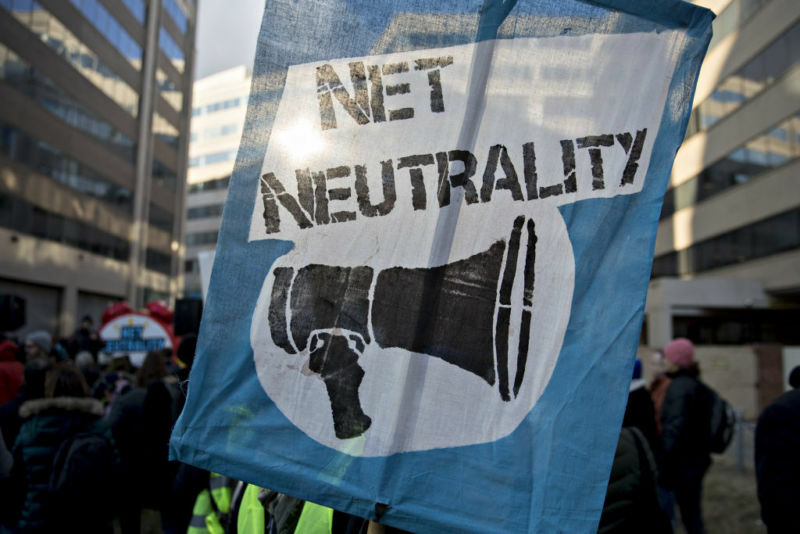 In May, the US Senate narrowly voted to reverse the Federal Communications Commission’s repeal of net neutrality rules. But the measure still needs majority support from the House of Representatives by a deadline of December 10, net neutrality advocates say. Advocacy groups Fight for the Future and Demand Progress organized a Day of Action for Thursday this week. The effort, involving individuals and businesses that run websites, will consist of social media posts, banner ads, and website alerts. The goal is to direct people to this “deadline for net neutrality” page, where they can sign an open letter to Congress. The effort is a long shot given President Trump’s opposition to net neutrality and the fact that Republicans control the House until newly elected lawmakers are sworn in on January 3, 2019. But advocates say public support is on their side. “Poll after poll shows that the overwhelming majority of people from across the political spectrum support strong protections against blocking, throttling, and paid prioritization of Internet content. In divided times, this is one of the few things we all agree on,” their open letter to Congress says. Without net neutrality rules, “monopolistic Internet providers like Comcast, Verizon, and AT&T—some of the least popular companies in the United States—will become the dictators of our online experience: they’ll control what we see, where we get our news, which businesses succeed, and which ones fail,” the letter also says. Open letter signers include Etsy, Tumblr, Postmates, Sonos, Foursquare, Namecheap, Private Internet Access, Startpage.com, Boing Boing, and many individuals. Lawmakers who haven’t supported the petition are listed here. Advocates are urging Americans to call, write to, or tweet at those lawmakers. “It’s time for members of the House to put partisan politics aside and protect the future of America’s Internet… This isn’t a political decision, it’s a moral one,” the open letter to Congress says. While the pending resolution would restore the repealed net neutrality rules in full and prevent the FCC from overturning them again, lawmakers could achieve the same or a similar outcome by writing a net neutrality law. House Democrats say they plan to take steps to protect net neutrality when they have the majority next year. But Republicans increased their Senate majority from 51-49 to 53-47 in the recent election, making it less likely that Democrats could get a strict net neutrality bill through both chambers of Congress.